Orthographic projection centered over Howland Island. 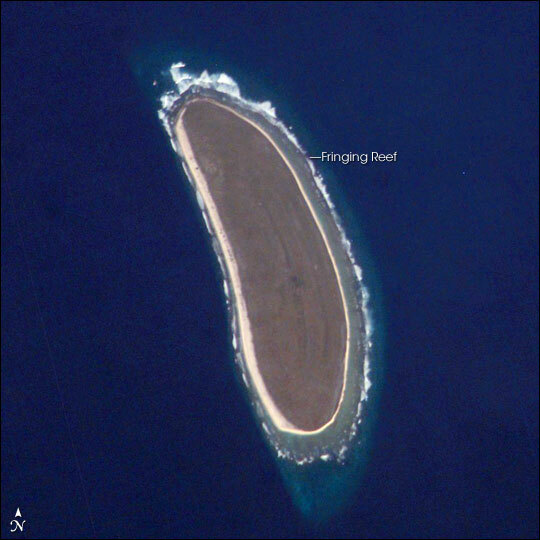 Howland Island is an uninhabited coral island located just north of the equator in the central Pacific Ocean, about 3,100 km (1,670 nm) southwest of Honolulu. The island is almost half way between Hawaii and Australia and is an unincorporated, unorganized territory of the United States, and is often included as one of the Phoenix Islands. For statistical purposes, Howland is grouped as one of the United States Minor Outlying Islands. The island was named after a lookout who sighted it from the whaling ship Isabella on 9 September 1842. However, the first recorded European sighting had already been made 20 years earlier from the whaler Oeno on 1 December 1828 and it was briefly named Worth Island after that ship's captain. Howland Island National Wildlife Refuge consists of the 455 acre (1.84 km²) island and the surrounding 32,074 acres (130 km²) of submerged land. The island is now a National Wildlife Refuge managed by the U.S. Fish and Wildlife Service as an insular area under the U.S. Department of the Interior. The atoll has no economic activity and is perhaps best known as the island Amelia Earhart never reached. Airstrips built in the late 1930s to accommodate her planned stopover were never used, subsequently damaged, not maintained and gradually disappeared. There are no harbors or docks. The reefs may pose a hazard. There is one boat landing area along the middle of the sandy beach on the west coast along with a crumbling day beacon. Defense is the responsibility of the United States and the island is visited every two years by the U.S. Fish and Wildlife Service. Located in the North Pacific Ocean at 0°48.4′N 176°37.1′WCoordinates: 0°48.4′N 176°37.1′W , the island is tiny at just 1.84 km² (455 acres) and 6.4 km of coastline. The island has an elongated shape on a north-south axis. The climate is equatorial, with little rainfall and a burning sun. Temperatures are moderated somewhat by a constant wind from the east. The terrain is low-lying and sandy: a coral island surrounded by a narrow fringing reef with a slightly raised central area. The highest point is about six meters above sea level. There are no natural fresh water resources. The landscape features scattered grasses along with prostrate vines and low-growing shrubs. A 1942 eyewitness description mentioned "a low grove of dead and decaying kou trees" on a very shallow hill at the island's center, but 58 years later (2000) a visitor accompanying a scientific expedition reported seeing "a flat bulldozed plain of coral sand, without a single tree" and some traces of building ruins. Howland is primarily a nesting, roosting and foraging habitat for seabirds, shorebirds and marine wildlife. The U.S. claims an exclusive economic zone of 200 nautical miles (370 km) and a territorial sea of 12 nautical miles (22 km). Since the island is uninhabited no time zone is specified but it lies within a nautical time zone which is 12 hours behind UTC. Captain George B Worth of the Nantucket whaler Oeno sighted Howland around 1822 and called it "Worth Island". Daniel MacKenzie of the American whaler Minerva Smith was unaware of Worth's sighting when he charted the island in 1828 and named it after his ship's owners. Sparse remnants of trails and other artifacts indicate a sporadic early Polynesian presence but Howland Island was uninhabited when the United States took possession of it in 1857 through claims under the Guano Islands Act of 1856. The island was known as a navigation hazard for many decades and several ships were wrecked there. Its guano deposits were mined and thoroughly depleted by American and British companies during the second half of the 19th century. In 1935 a brief attempt at colonization was attempted, part of a larger project administered by the Department of Commerce to establish a permanent U.S. presence on the equatorial Line Islands. It began with a rotating population of four alumni and students from Kamehameha School for Boys, a military school in Honolulu. Although the recruits had signed on as part of a scientific expedition and expected to spend a three month assignment collecting botanical and biological samples, once at sea they were told, "Your names will go down in history" and that the islands would be developed into "famous air bases in a route that will connect Australia with California." The settlement Itascatown, near the beach on the island's western side, was a line of no more than half a dozen small wood-frame structures and tents named after the U.S. Coast Guard vessel that brought them and made regular cruises between the islands during that era. The fledgling colonists were given large stocks of canned food, water, and other supplies including a gasoline powered refrigerator, radio equipment, complete medical kits and (characteristic for that time) vast quantities of cigarettes. They varied their diet by fishing. Most of their work involved making hourly weather observations and gradually developing a rudimentary infrastructure on the island, including the clearing of a landing area for airplanes. During this period the island was on Hawaii time which was then 10.5 hours behind UTC. Similar colonization projects were started on nearby Baker Island, Jarvis Island, and two other islands. Ground for a rudimentary aircraft landing area was cleared during the mid-1930s in anticipation that the island might eventually be used as a stop-over for a commercial trans-Pacific air route and to further U.S. territorial claims in the region. In keeping with its potential aviation role Howland Island was a scheduled refueling stop for American pilot Amelia Earhart and navigator Fred Noonan on their round-the-world flight in 1937. WPA funds were used by the Bureau of Air Commerce to construct three graded, unpaved runways meant to accommodate Earhart's modern twin-engined Lockheed L-10E Electra. The facility was named Kamakaiwi Field after James Kamakaiwi, a young Hawaiian who arrived with the first group of four colonists, was subsequently picked as leader and spent a total of over 3 years on Howland, far longer than the average recruit. It has also been referred to as WPA Howland Airport (the WPA contributed about 20% of the $12,000 cost). Earhart and Noonan took off from Lae, New Guinea and radio transmissions from Earhart were picked up on the island when their aircraft reached its vicinity but they were never seen again. Earhart Light, pictured here showing damage it sustained during WWII, was named for Amelia Earhart during the late 1930s. A Japanese air attack on 8 December 1941 by fourteen twin-engined bombers killed two of the Kamehameha School colonists (Richard "Dicky" Kanani Whaley and Joseph Kealoha Keliʻhananui) at the beginning of U.S. involvement in World War II. The three airstrips of Kamakaiwi Field were targeted and damaged in the raid. Two days later, a Japanese submarine shelled what was left of the government colony's few buildings into ruins. A single bomber returned twice during the following weeks and dropped more bombs on the rubble of tiny Itascatown. The two survivors were evacuated by a U.S. Navy destroyer on 31 January 1942. The island was occupied by a battalion of United States Marines in late 1943 and known as Howland Naval Air Station during this brief period but was abandoned after the war (the colonization projects on the other four islands were also disrupted by the war and ended at the same time). Kamakaiwi Field suffered more damage during World War II and later all but disappeared. Ironically, while the atoll was colonized in 1935 as a future aviation facility and is referenced in popular culture almost exclusively because of its association with the last flight of Earhart and Noonan, no airplane is known to have ever landed on Howland Island. By the 1970s Howland Island was overrun by a population of feral cats, descendants of individuals brought by earlier human colonists. The cats were gradually removed during the 1980s and the area was designated a bird and wildlife refuge. However, abandoned World War II military debris continued to be a concern. Amateur radio enthusiasts made several authorized visits to the island during the 1990s and early 2000s. In 2006, trespassing by commercial fishing boats and their helicopters was cited as a serious problem. Public entry to the island is by special-use permit from the U.S. Fish and Wildlife Service only and is generally restricted to scientists and educators. Representatives from the agency visit the island on average once every two years, often coordinating transportation with amateur radio operators or the U.S. Coast Guard to defray the high expense of logistical support required to visit this remote atoll. Earhart Light is a day beacon or navigational landmark shaped somewhat like a short lighthouse (with no illumination), painted with wide stripes and meant to be seen from several miles out to sea during daylight hours. It is located near the boat landing at the middle of the west coast by the former site of Itascatown. It was partially destroyed during early World War II by the Japanese attacks, but was rebuilt in the early 1960s by the US Coast Guard. By 2000, the Earhart beacon was said to be crumbling and hadn't been painted in decades. ^ Long, Elgen M. and Marie K. Amelia Earhart: The Mystery Solved. New York: Simon & Schuster, 2000, p. 206. Quote: Thursday, July 1, 1937… Howland Island was using the 10+30 hour time zone — the same as Hawaii standard time…"
This page uses content from the English language Wikipedia. The original content was at Howland Island. The list of authors can be seen in the page history. As with this Familypedia wiki, the content of Wikipedia is available under the Creative Commons License.